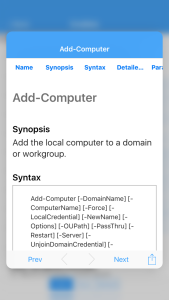 SAPIEN has just released another update to iPowerShell Pro, its iOS-based PowerShell editor and remote connectivity tool. 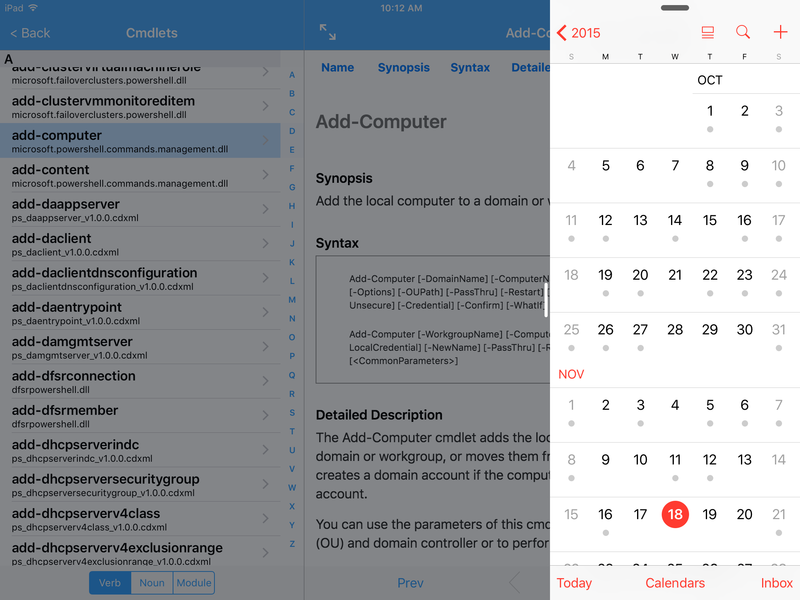 With this update, we focussed primarily on iOS 9 compatibility. 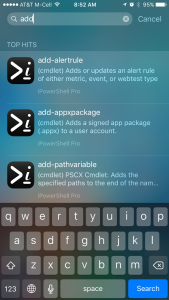 iPowerShell Pro is now a good citizen in the iPad multi-tasking community. 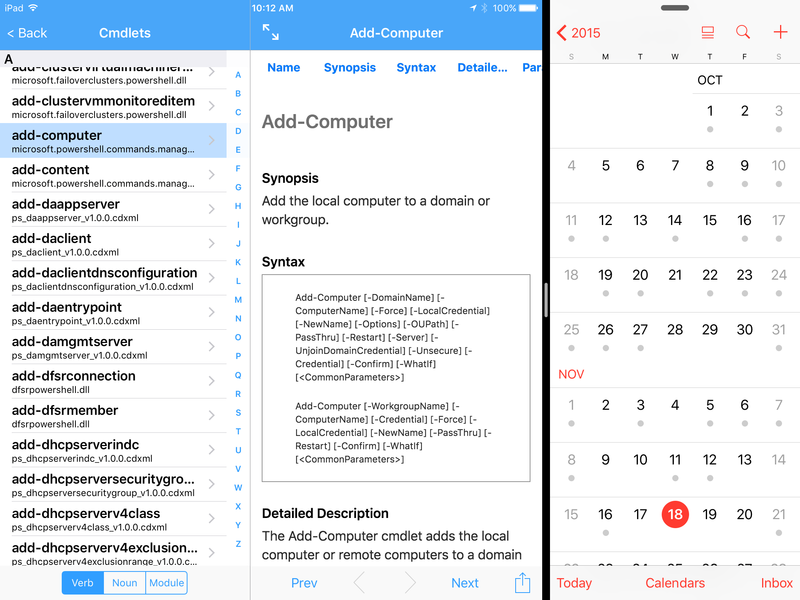 If you’re using an iPad running iOS 9, you can split the screen and use two apps at the same time. 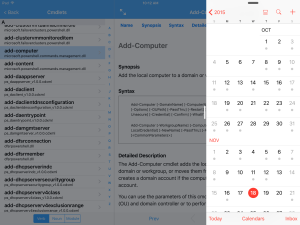 This can take several forms depending on your iPad version. Slide over – Slide Over lets you interact with a second app without leaving the app you’re currently using. To see your previously-used apps, swipe from the right edge of the screen to the left. The primary app on the left side is grayed out and is not active. 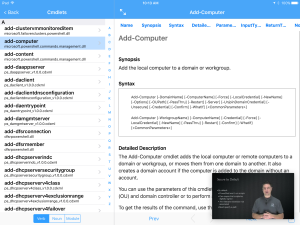 Slide Over works with iPad Pro, iPad Air, iPad Air 2, and iPad mini 2 or later. 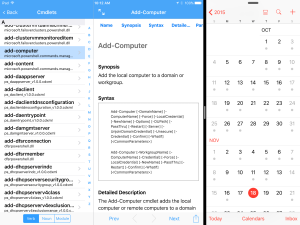 Split View – With Split View, you can open and use two apps at the same time. Open the first app. Then, to use both apps, tap or drag the app divider. Split View isn’t available for all apps, but iPowerShell Pro now fully supports it. You can use Split View in a 1/2 split, as seen in Figure 3, or a 2/3 split, as seen in Figure 4. 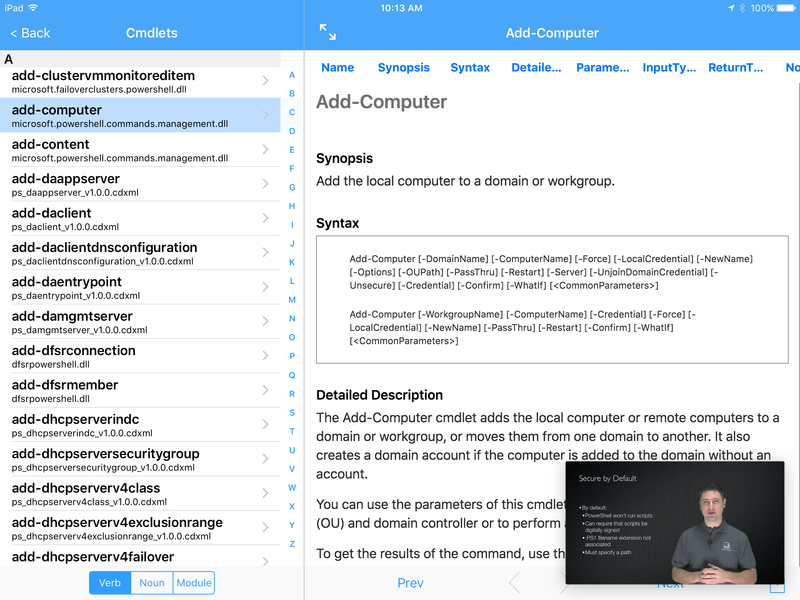 Split View is available on iPad Pro, iPad Air 2 or iPad mini 4. Picture in Picture – You can watch videos in iPowerShell Pro in the Picture in Picture view. For example, using picture in picture in the iPowerShellPro Videos section, you can watch a training video while browsing through cmdlet descriptions. 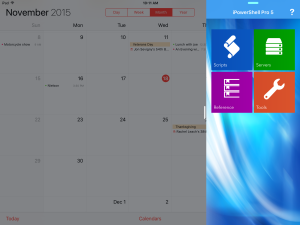 You can use Picture in Picture with iPad Pro, iPad Air, iPad Air 2, and iPad mini 2 or later. We have upped our game when displaying cmdlet help, About help, and Alias and Provider Help content. Nicer fonts and presentation for code snippets and text, all of which are responsive to the system font sizing, make reading the help files much easier. 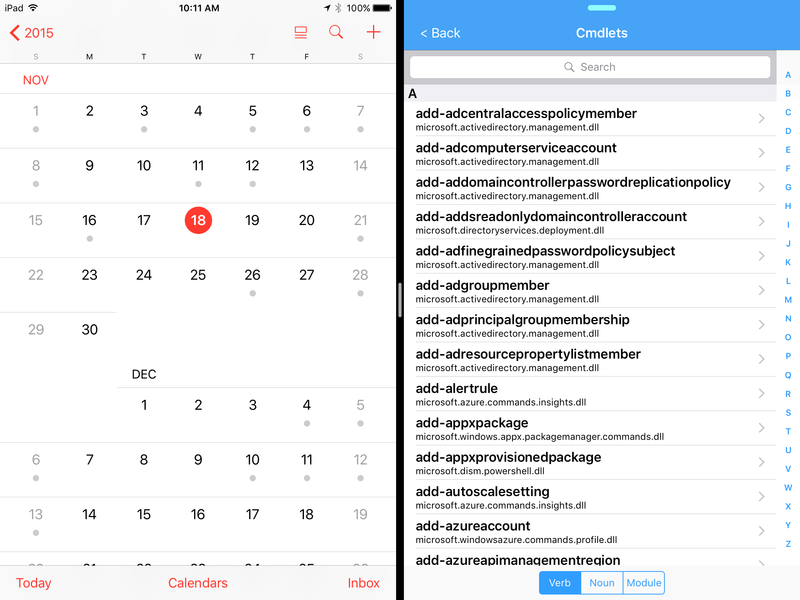 For users of iPhone 6s and 6s Plus, we have implemented Home Screen Quick Access. 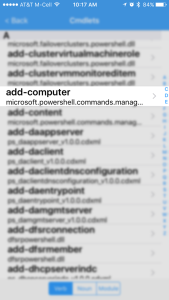 When you press lightly on the iPowerShell Pro home screen icon, a popup menu appears with shortcuts to Cmdlets, Aliases, About-Help and Providers. 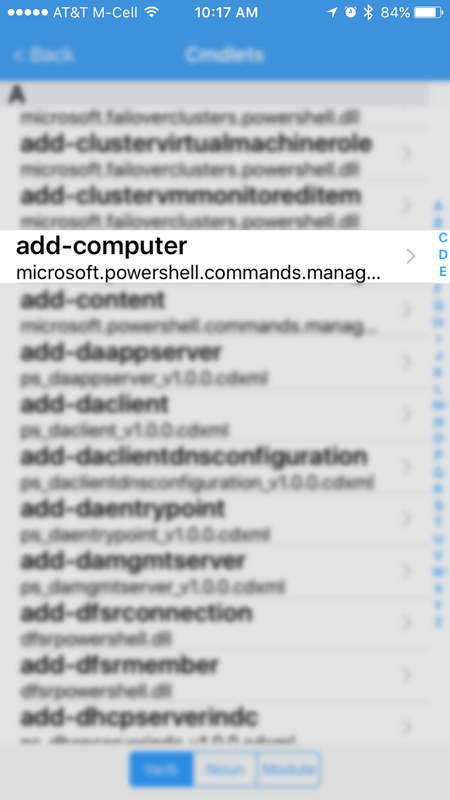 To start iPowerShell Pro Quick Access mode automatically, just tap on an item in the popup menu. 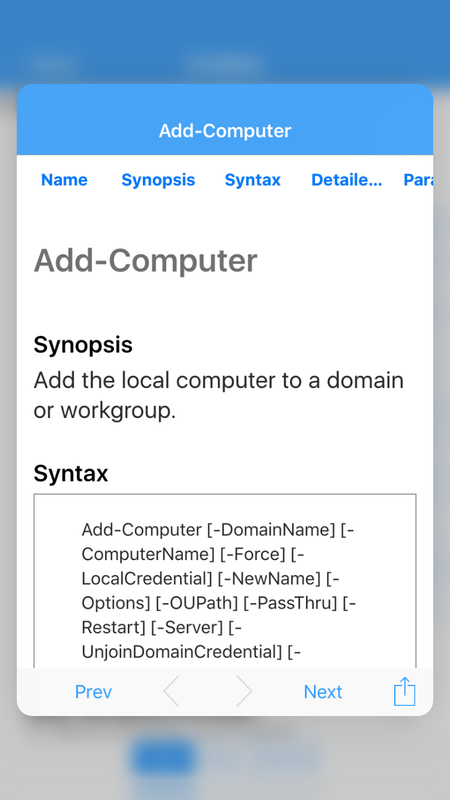 Also, for iPhone 6s and 6s Plus users, we have added peeking and popping for cmdlets, aliases, About Help and providers. 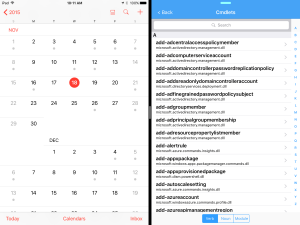 To highlight a selection, press lightly on any list, as seen in Figure 8. A bit more pressure displays the description in a temporary (it disappears when you release the pressure) popup window (Figure 9). Adding more pressure to the screen makes the description POP to full screen (Figure 10) and remain displayed even when you remove your finger. This is a very convenient feature to peek into a cmdlet to determine if that is the one you need and then pop it to full screen to read the full description. iOS 9 implements App Transport Security (ATS) which requires that all web-based communication be implemented via HTTPS rather than HTTP. 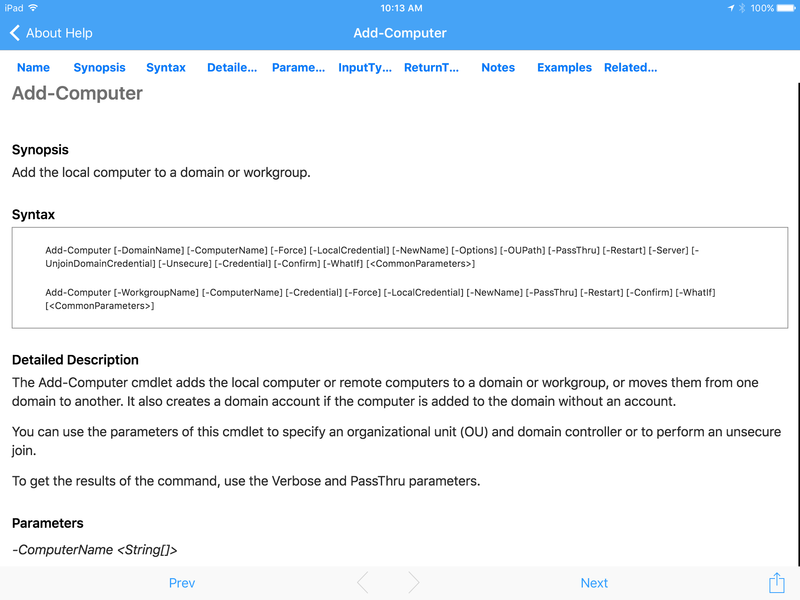 This release of iPowerShell Pro implements ATS for all endpoints that we can control. As third party endpoints change over to HTTPS, we will extend the implementation to include those locations. We have added NSUserActivity indexing to cmdlets, about_help and providers. 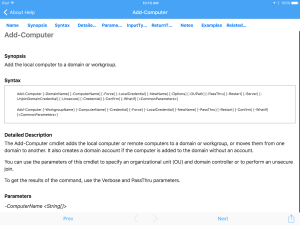 When you view any item in these lists, that full content is now added to the on-device search index so you can easily use Spotlight to search for PowerShell information and return to previously viewed content. Additionally, whenever you download your data from our servers, we immediately index all of the cmdlet, about_help and provider topic names so that you can search for a cmdlet name using Spotlight and then display that content with a single tap. 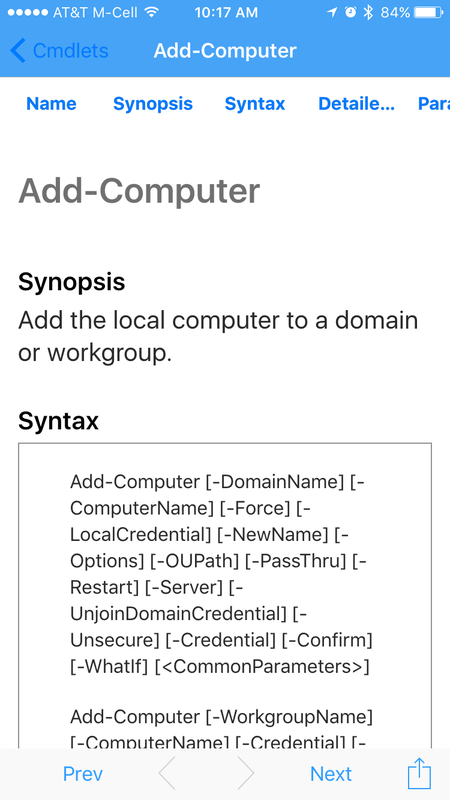 We have also added support for Universal linking to the application. 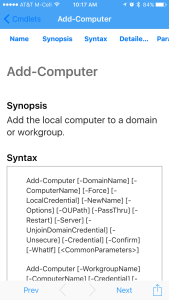 When we finish adding all of the cmdlet, about_help and provider information to our website, doing a web search for that information will provide a Universal Link to view the information in iPowerShell Pro. Of course, we have squashed a few bugs and improved the code in various places to continue to give the user a reliable and performant product. Make sure to download the free update to the new version of iPowerShell Pro (5.0.135). 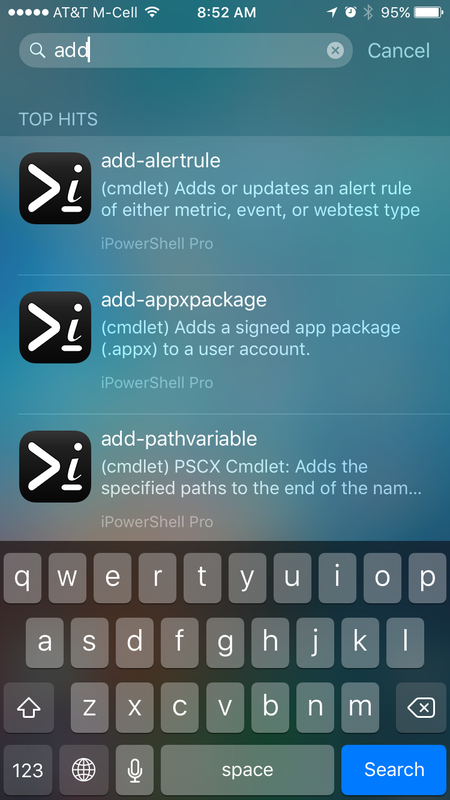 If you have never used iPowerShell Pro, its only $4.99 and its available on the App Store!